January 26, 1945. The attack resumed to east to take Espeler. 1st and 2nd Battalions were pushed forward to high ground flanking town then 3rd Battalion was sent in gap between to enter the town. The attack was a surprise to the enemy and 3rd Battalion entered town with little opposition, catching the enemy off-guard. 185 prisoner of war were taken and it is believed that the enemy was in the process of reinforcing the Espeler garrison with the strenght of a Regiment. The US supporting artillery was very effective in engaging several columns and boxing at the town. One of many PW's taken was an American Medic that had been with the Germans since the German offensive in December, when his unit was overrun. Division objective was taken and Regiment was relieved by 87th Infantry Division. January 27, 1944. The Regiment was placed in Divisional Reserve and received order to move south west to Noertrange (Great Dutchy of Luxembourg) (corrdinates 691550). The journey was made by truck. From this place, Battalions began shuttle to Rest Area located in the little town of Virton (Belgium) for 24 hours and partial issue of winter shoes and gloves. This photo extracted from "TALON with the 17th in Ardennes" shows men of the 513th PIR on the road to Germany (TFH collection). January 28 to 30, 1945. Battalions rotation to Virton continued. January 31, 1945. After four days of rest, the 513th Parachute Infantry Regiment went back up to the front line in the vicinity of Hosingen (coordinates 822588) and vigorous patrolling begun. Enemy contacted immediately west of Our river. February 1, 1945. Patrolling continued actively with no enemy contact west of river in the Regimental zone. Strong outposts were pushed to within 1500 yards of Our river with Observational Post overlooking and within 800 yards of river. Having relieved the 193rd Glider Infantry Regiment in the line in vicinity of Hosingen, January 31, 1945, the Regiment at this date occupying defensive positions on the west bank of Our river facing the german Siegfried line fortifications. The regimental boundaries are limited on the north at the Our river (coordinates 853615) and on the south at coordinates 864578. The 507th PIR is to the north and the 6th Cavalry to the south. The Regiment is disposed with 3rd Battalion on the north, 2nd Battalion on the south and 1st Battalion in reserve at Bockholtz along with the Regimental Command Post and Hq & Hq Company. The Our river was frozen over on the night of January 31. Active patrolling was initiated at once to the Our river. Elements wich the Regiment had relieved reported the enemy to have about 120 me, believed to be of the german 5 Fallschirmjaeger Division, along the west bank of the Our river. Company E was sent to clear the enemy from the draw in the north part of the regimantal sector. Much evidence of recent occupation was found but he had withdrawn hastily to the east side of the Our river and no actual contact was made. Continued patrolling found the west side of the Our river in the regimental sector to be clear of the enemy, though he was reported by adjacent units to be occupying Rodershausen and Eisenbach to our north and south flanks respectively. On the night of January 31 to February 1, a patrol of the 2nd Battalion crossed on the ice to the east side of the Our river to probe the enemy defenses and capture prisoners. The patrol located several enemy positions but were fired upon by MG's from these positions as they closed in. They were forced to retire. During the day of February 1, patrolling continued and Battalions reported west bank clear. Other photo extracted from "TALON with the 17th in Ardennes" showing 513th PIR area in the Great Dutchy of Luxembourg (TFH collection). February 2, 1945. The Regimental defensive positions were improved and patrols attempted to cross Our river again but due to warm weather during the day the river ice had melted and they were unsuccessful. Late in the afternoon, Hosingen was subjected to heavy artillery and mortar fire. The German troops remained quiet except for intermittent shelling throughout the night. 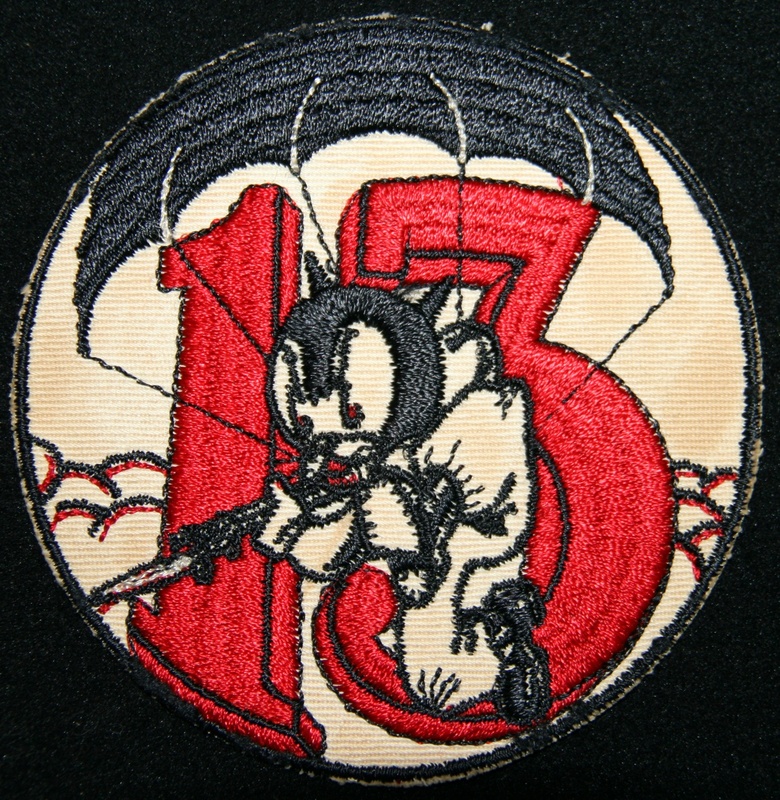 February 3, 1945. The men kept their positions and continued to improve defensive positions. Five observation posts established across the Regimental front. German artillery and mortar fire continued to harass the positions with the 2nd Battalion Observational Post receiving constant and accurate fire. The allied artillery was active in placing accurate concentrations on all German movement seen by US forward observers. Roads and draws were found to be heavily mined with anti-tank and anti-personnel mines. 1st Battalion patrol during the night of February 2 to 3 attempted to cross the Our river but melting snows and ice blocks made the river extremely difficult and dangerous. One try with an assault boat resulted in overturning and spilling its occupants into swift water. All personnel were rescued. Two attempts were made at wading and swimming but the current was too much. February 4, 1945. Defensive positions continued to be improved. 1st Battalion took over sector of 6th Cavalry Group on the south, extending the Regimental sector to the south to limiting point on Our river at coordinates 862575. Patrols again attempting to cross Our river met with misfortune from the swift and rising river, frustrating every attempt with boat and swimming. On the 2nd Battalion area, 1st Lieutenant John W LEARY was volunteered to lead his eleven men's platoon to establish a bridgehead on other side of the Our River and probed the Siegfried Line defenses. Facing the well organized defenses from the Siegfried Line, he maneuvered his men under mortars and machine-gun fires. The patrol launched an attack on a strong point and destroyed it but John was seriously wounded at the abdomen by fire from another bunker. Understanding rapidly it was not possible to pursued the mission, he ordered the retreat but remained behind to cover the retreat in opening fire with his Thompson machine-gun, sacrificing his life for his men.Increased German activity was reported from Observational Post's. In the area of Übereisenbach, a group of twelve men were seen repairing a blown bridge. Thirty to forty German soldiers were observed in and around the buildings of Übereisenbach. US artillery was called in with excellent results. German troops continued shelling the American positions with 2nd Battalion Observational Post receiving several direct hits. February 5, 1945. The GI's continued to work on their positions. 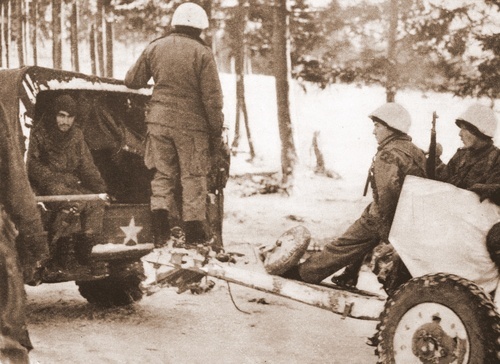 During the night of February 4 to 5, patrol of 3rd Battalion approached the Our river with equipment for crossing. They walked into an anti-personnel minefield in the pitch darkness. Four mines were tripped, causing several casualties of the eight man patrol. A patrol of the 2nd Battalion succeeded in crossing the river. A German outpost was located and in closing in upon it, they were discovered. A hand to hand fight ensued in which a German NCO and three others were killed. The American patrol sufferd four injuries, all of which were returned when the patrol withdrew to the west side of the river. German activity was practically nil during the day. Very little movement was noted and shelling was less than usual. February 6, 1945. The Regiment continued its defensive mission on Our river. The German army was becoming sensitive to American patrol efforts. The German soldiers was making extensive use of flares and frequently fires bursts from automatic weapons at the slightest sound in the darkness. The 2nd Battalion Observational Post again was subjected to intense shelling with several direct hits being scored upon it. A patrol of the 3rd Battalion again (Sergent Don Scott's Patrol) had difficulty with mines. "S" mine (also called Bouncing Betty) explosions killed one and wounded two of a patrol. A patrol of the 1st Battalion in attempting to cross the Our river failed because their boats were capsized by heavy ice flows and the raging current. One man was lost. February 7, 1945. The German shelling was light during the day and night except for the 2nd Battalion Observational Post who continued to be harassed by accurate mortar fire, getting two direct hits but no casualties. The 1st Battalion reported enemy infiltrating to west side of Our river in adjacent unit's sector to the south. A patrol of 1st Battalion fired upon two German soldiers in vicinity of Eisenbach and reported seeing about 20 other German soldiers on east side of Our river in Übereisenbach. Outposts were alerted for possible enemy attempts to gain a foothold on west side of Our river during the night and several ambush patrols were set up. However, the German units made no attempts to enter the Regimental sector during the night. February 8, 1945. Defenvsive mission continued. 1st Battalion patrol during the night of February 7 to 8 succeeded in crossing the Our irver in assault boats. Their landing was opposed by heavy small arms fire from extremely short ranges. The patrol was pinned to the river bank. They withdrew under heavy fire, protected only by the darkness of the night. When all had returned, artillery fire was directed upon the German positions with excellent results. The 2nd Battalion was successful in getting an eleven man patrol across the river with the intention of establishing a bridgehead across a long, narrow strip of land edged by the Our river. This patrol discovered a massive pillbox that was unoccupied. Continuing, they found a tremendous concrete and iron bunker wich they blew open with grenades and bazooka, killing at least three German soldiers. Another compartment was fired into with bazooka rounds. The patrol continued with its mission and established their bridgehead. Soon they were attacked by an enemy force of about 20 men, wich they destroyed. The German counterattacked shortly afterwards with about 40 men. The patrol was successfully holding this attack and a company was about to enter boats to reinforce them when the bridgehead was ordered withdrawn. They withdrew with the loss of one officer. The enemy has succeeded in getting small groups to the west side of the Our river during the night in the vicinity of Eisenbach. The 1st Battalion sent a patrol to clear them out. They had great difficulty in approaching the town due to the German's first use of his direct firing artillery from emplacements on east side of river. Four such artillery positions were exposed during this action. The patrol succeeded in entering the town of Obereisenbach, capturing one prisoner and driving him from the Regimental sector to the south. The 3rd Battalion again had mine trouble. One killed and three wounded from "S" mines. Enemy continued harassing our positions with artillery and mortar fire throughout the day and night. February 9, 1945. Battalions report that enemy activity again cleared from west side of Our river within Regimental sector. Mines were extensively laid according to the defensive plan, particularly in the vicinity of Hosingen. The enemy remained quiet except for his sharp watch for American movements. Every exposure brought immediate mortar or atillery fire. February 10, 1945. 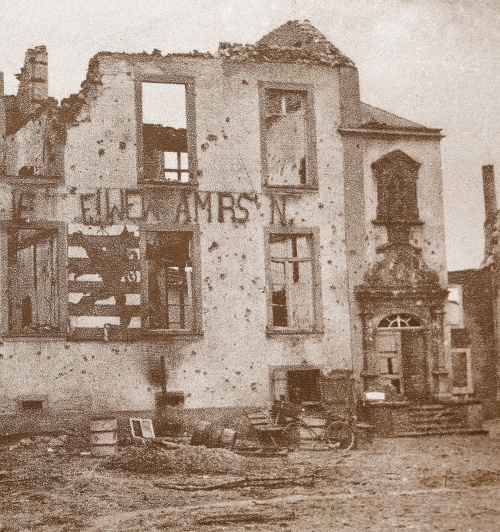 The 513th Parachute Infantry Regiment was relieved by 184th Combat Engineers at 07h30 and proceeded to vicinity of Châlons (France) for reorganization and rest. 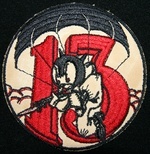 On February 10, 1945, at the end of that terrible winter campaign, 229 men of the 513th PIR have been killed in action. Much more were wounded in action. For example, on December 1944 there was a total of nearly 150 men in Company I. Less than 60 were still in duty at the end of the Battle of the Bulge !